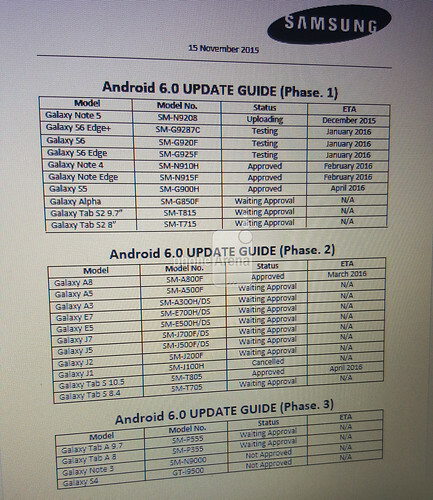 We've just been tipped Samsung's latest Android 6.0 Marshmallow update roadmap, and there are quite a few changes from the last version that leaked out. 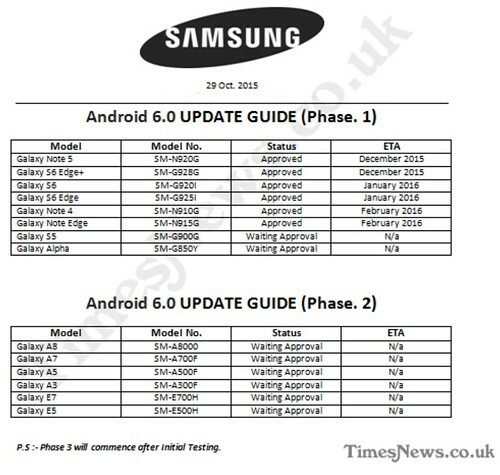 First off, the Note 5's update is imminent, as you can see in the table, which is corroborated by the system dump and Marshmallow-ed TouchWiz that are already making the rounds here and there. The last edition of the roadmap listed Galaxy S6 edge+ for update in December, in sync with the Note 5's schedule, but this has now been moved to January. The Galaxy S6 and S6 edge remain in the January queue, while the Note 4 and Note Edge are due in February, like before. The similarities between the two roadmap versions stop here, though, as the Galaxy S5, which was listed as awaiting approval last time, is now due to get Marshmallow in April. The Galaxy A8 also used to be in the pending queue, and now it has been all set for March. Our latest list is fleshed out with many more Samsung handsets and tablets now, too, but, unfortunately, the oldie Note 3 and Galaxy S4 are a no-go. Almost all of the A, E and J-series (save for the Galaxy J1), however, are now in the queue, scheduled for the next Marshmallow rollout phase by Samsung. Of course, as with all internal projects, the schedule will be in flux and phones can be added later, or updates pulled forward, but it seems that by mid-spring most Samsung gear should be already on Marshmallow.